The photo (above) shows one of Cosmo's products. It even has an image of Robert Burns on it, rendered in Haggis! The Scottish Bard's Address to a Haggis may not be as succinct as Dante, but here it is—at least the last verse (of eight). Does this mean war between Naples and Scotland? Probably not, but I draw the line at peanut butter. p.s. Friend and pervert Peter H. suggests the equally appetizing Balut pizza. A balut is a developing duck embryo that is boiled alive and eaten in the shell. (Aug 8) As I note here, the “raspberry” (also known as a “Bronx cheer” in the US) is a well-known rude noise. Every Neapolitan's favorite films involve either Eduardo de Filippo or Totò making such noises. School kids keep the tradition alive, thank heaven! But now—enough is enough. It seems that the stairwells and corridors of the building in Naples where the city council meets are alive with the sounds of cat-calls and raspberries every time a council member passes. Cease and desist or pay the consequences, so warns a new directive—no more rude noises, sounds of derision, etc. Strange headline and article, though, in a local paper. It consistently used the word pernacchia for the most offending sound. It is true that the form with -a is correct Italian, but the -o form, pernacchio is the most common form in Naples, as Giuseppe Marotta points out in L'Oro di Napoli (see the link in the first sentence or none of this will make sense!) and there is a difference. City council members have no doubt been getting the o-form and not the a-form. Grammar, friends, grammar. (Aug 9) The 67th Locarno film festival is currently going on. 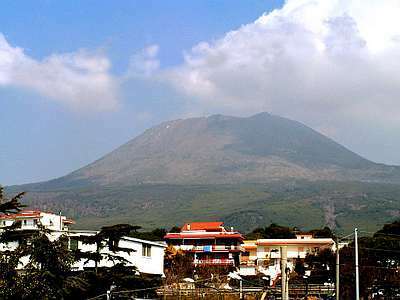 One of the films being shown is Sul vulcano (On the volcano), about Vesuvius, Naples, fatalism, and the social and political connivance (the director's term) that continues to accept—and even promote—living in an area that is at such risk (photo, right!). (See this link for a history of recent eruptions. Also, the area near Vesuvius is the most densely populated in Europe!) The director of the “docu-film” is Gianfranco Pannone (b. Naples, 1963). He now lives and works primarily in Rome. In the past few decades he has gained international recognition as a maker of documentaries. His general focus has been on Italian culture and socio-political struggles and often the connection between Italian and American culture, illustrating what the "American Dream" has meant to Italian society. (For example: his "American Trilogy": Piccola America (Little America, 1990), Lettere dall'America (Letters from America, 1995) and L'America a Roma (America in Rome, 1998). He favors what he calls an "investigative, human" style of documentary, as opposed to, say, Michael Moore's approach-- "interventionist, expository." Pannone is very much in the tradition of Italian Neo-Realism; indeed, he cites directors such as Roberto Rosselini and Vittorio de Sica as among those he admires. That is, he likes to set up a complex historical background (the 'docu-') and then tell stories through the lives of ordinary people (the '-film'), and let viewers draw their own conclusions. The film will be in Italian cinemas in September. That was how I started an article about the gardens of the Mortella of Susana, Lady Walton, many years ago. (You may read the rest at this link.) She was a delightful woman, always mock-horrified that many foreign visitors confused the name of the gardens, mortella (myrtle), for mortadella, a type of Italian pork sausage! She was energetic; I remember her running—and I mean running—the groundskeepers through a fire-drill one fine morning during a particularly dangerous dry spell on the island.) Lady Walton passed away in 2010, but the gardens continue, as do the musical activities that are associated with them and with the life of composer, William Walton. La Mortella used to keep as mascots a couple of goats that delighted young visitors to the gardens. Those animals were unfortunately killed by stray dogs that got onto the grounds. The good news is that they have been replaced by a private donor, whose daughter was upset that the goats were gone. Three Tibetan goats are now on the grounds. The director of the gardens says that the donor refused payment and simply said, "It's enough for me that I can walk into this enchanted place and take my daughter to see the goats. She loves them." (Aug 9) And speaking of... (many Neapolitans, not to mention Strombolians or Strombowlers or just plain Strombol-people may blame me for this because I was talking about volcanoes and that'll do it! )...the island volcano of Stromboli is now erupting again. Stromboli is the northernmost of the Aeolian Islands, a group of some seven islands north of Sicily. Some of the other islands also have active volcanoes, including the appropriately named isle of Vulcano. The volcano on Stromboli is ominously nicknamed, simply, Iddu—Him!—by residents of the island. More here and here. There are only abut 400 residents of the island, a number greatly down from a few thousand many decades ago; they didn't leave because of the eruptions but largely from economic crises that made it very difficult to ply the fishing trade. They were (and remain) used to these eruptions. In one fashion or other, this effusive (as opposed to explosive) volcano* is almost always active. This particular time around, however, seems a bit more spectacular than most recent ones. It is summer and the cruise ships from elsewhere in the Aeolians are crowding around for a look-see. The Italian coast guard is busy trying to keep them back. (Sept 4) I see that the Trekking & Paddles kids who run rafting, kayaking and other good Tom & Huck water sports in the Cilento have expanded their reaches this year to a river called the Lao. That one is way down south. (I guessed Asia before I looked it up. As it turns out, there is also a Lao river in Thailand, so I was half-right!) The Lao river is called the Mercure at the headwaters at about 1600 meters (4800 feet) on the western slope of the Pollino mountains in the Lucanian Appenines in the Basilicata region of Italy. 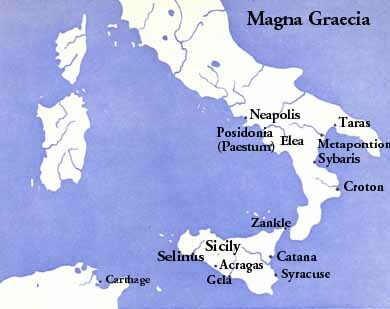 It changes name (for the ancient Magna Grecia city of Laos) as it flows into the region of Reggio Calabria. It flows through a number of towns such as Laino Borgo, Laino Castello, Papasidero and Orsomarso. The Lao is then joined by the Argentino river and flows into the Tyrrhenian sea near Scalea in the province of Cosenza (just about where the ankle in the boot of Italy starts to slope into the instep!) The total length of the river is 51 kilometers (32 miles). There is a Lao river nature preserve to protect the flora and fauna as well as to promote rational tourism. That nature preserve is part of the Pollino National Park, the largest national park in Italy, covering nearly 2000 sq. km (772 sq. miles). Much of the park is wooded slope, with bare grassy summits rising above. The highest points are Serra Dolcedorme (2267m) and Monte Pollino (2248m) (about 7,000 feet). This part of Italy is sparsely populated and offers a chance to see landscape that has not been damaged too much by man. Where people are present, they are usually in small villages and on farms. Traditional ways of life are still important, including the many annual rural festivals. There is also a cluster of Albanian villages, dating back to migrations in the fifteenth and sixteenth centuries. (Sept 4) Best Beach! "May you live in interesting times" is a Chinese curse disguised as a benevolent wish. On the Campanian coast, there is (or should be) something similar: "May the Environmental League select you as the most beautiful beach in Italy." That is what happened to Cala degli Infreschi near the town and port of Camerota. * It is on a stretch of deserted coast leading from the southern end of the bay of Salerno to the northern end of the Bay of Policastro. (Marked in red on the coast at the bottom of the map, right.) There are no roads visible from the sea; nothing but a Saracen tower or two. You have to sail or hike in, like sailing or hiking back in time...except that when the word got out that this was the place to go, 500 people showed up in a few hours plus a few hundred noisy motor boats and rubber dinghies (forget what I said about sailing). The stretch of coast is part of the Cilento and Vallo di Diano national park and is even listed on the UNESCO World Heritage sites because of the anthropological finds that have been made in the Camerota coastal caves demonstrating the existence of early human activity. Presence of modern humans on the beach is limited by law to 67 persons; boats have to keep hundreds of yards from shore. So the other day, the coast guard was scooting around handing out whatever the maritime equivalent is of parking tickets and shooing hikers back to where they came from. * The whole western coast of Italy is a land of legend. Camerota supposedly derives from Kamaratòn, the name of a particularly hard-hearted local girl who spurned the love of Palinuro, himself--Aeneas' helmsman. Venus punished K. by turning her into the rock upon which the city of Camerota would one day be built. Poor Palinuro, imagining K.'s image in the water, threw himself into the sea and followed the vision all the way down to his death, thus fulfilling the prophecy that before Aeneas could land on the coast (to found Rome) a member of his crew would have to be lost. (Sept 4) An exhibit called Carriages of the Grand Tour has reopened at the Villa Pignatelli museum on via Chiaia. It is a very complete and fascinating hands-on exhibit of the way our well-heeled great-great somethings-or-other used to rattle around the bone-jarring roads of Europe, in general, and Italy, in particular to inhale the glory that was the ancient world and the Renaissance: Vienna, Venice, Florence, Rome, Naples, Pompeii, Herculaneum, Paestum, etc. etc. No backpacking. No shorts. None of that. You dressed in style and made yourself comfortable (HAH!) in one of the many kinds of coaches and barouches (look it up? I did! ), 34 models of which are now on display in the exhibit. The exhibit was closed for so long that the last time it was open the coaches were the latest in refined transportation. (Well, not quite, but 20 years?!) The opening was accompanied by actors playing Grand Tourists, reciting dialogues they might have exchanged back on the real Grand Tour: "Harold, are you sure that Florence has a volcano? Will you PLEASE stop and ask for directions!" Depending on when you go for the rest of the summer, you might get some of that thespian action, but even if you don't, you can still enjoy the exhibit. There is ample explanatory written and interactive material. (Sept 4) We'll see how this turns out. The city assessor for tourism for the city of Castellammare (at the beginning of the Sorrentine peninsula) has flat-out denied any intention to turn the beach-side public park, the villa comunale (image, right), into a suk--using the term his detractors use. The word is from Arabic and means a market place. In Italian, it is almost always used in a pejorative sense of a chaotic and overcrowded place of shifty merchants and and shiftless customers. In the meantime, he has already authorized eleven concessions of various sorts to open along the beach front and has plans for more. "It'll be just like Rimini," he says. (Rimini, on the Adriatic, is one of the most famous seaside resorts in Europe. It has a 10-mile-long beach and 1,000 hotels!) Well, that does remain to be seen--that is, can all of this be somehow fit into the master plan to rejuvenate the entire beach area of Castellammare? Or, will you just wind up with itinerant peddlers and countless cars with no place to park stalled in front of a hastily built movida?— (from the Spanish—a night club with blaring music that annoys locals trying to sleep). The assessor says the public park and beach are blighted with weeds and refuse, and the new concessionaires are now cleaning up daily and giving the beach back to the people. The nay-sayers point out the recent coming-into-being on city property along the beach of a new paintball field, a dog-training facility, and various fast-food stands; they ask: Is this really part of a master plan? Really?! (Sept 5) Villa Rufolo. The Campania region of Italy and the Ravallo Foundation have announced plans to "restore" the Villa Rufolo in Ravello, the centerpiece of the yearly Ravello Festival. It's not that the villa is not in passable condition. It is. I go there all the time and it looks good, befitting a venue for one of the most prestigious cultural events in the world. It's just that...well, fix the irrigation pipes for the beautiful gardens, more lighting and video surveillance, work on the main auditorium, resurface the south and west facades of the villa, itself, and—the big one, turn the Great Tower into a museum—that's going to take some money. The museum will include a library with significant number of books from the Neville Reid collection; he was the Scotsman who bought the villa in the 1800s and started the restoration that led to the premises we see today. The current project will cost over three million euros and take two years. (Sept 5) Long overdue. Over the course of many years I have noticed how nice and Pompeian red the southern face of the Royal Palace manages to look. The city has kept it up; that side of the palace is, after all, the face that the city turns to the world--or at least to the Bay of Naples and the main passenger terminal. It is what many tourists first see if they arrive on one of those huge cruise ships. The bad news is that most tourists really arrive from other directions—maybe the airport or the train station—and the first glimpse they have of the Royal Palace is from the west. They wander into the giant square of Piazza del Plebiscito and stare at the face of the main entrance to the palace. It, too, is Pompeian red, but only after Vesuvius got through with Pompeii—faded and grimey is putting it kindly. All that is about to change. The royal palace is now caged in row upon row of scaffolding as workmen prepare for the mother of all paint jobs. The long-needed work has had recent prodding from various incidents of crumbling masonry in the area. I have no idea how long it is going to take. Certainly months. (Sept 5) In spite of all the financial problems that beset Pompeii, one of the great tourist attractions in the world, this summer has seen some impressive activity. The guardians of culture have restored and opened 10 new houses on the premises, some of which have never been open to the public before. They have also employed 30 extra groundskeepers for the summer season. Among other items now open is the Ancient Hunting Lodge (Casa della Caccia Antica) featuring an extensive hunting scene still visible on one of its garden walls; also open is the Thermopolium (restaurant) of Vetutius Placidus; it has shrines to Mercury and Dionysus (the gods of commerce and wine, respectively), a dining hall, and an adjoining mansion with a vestibule, a garden, and a dining room. All that and much more. (Sept 6) Bike sharing in Naples? What can I say? I'll believe it when I ride one and will apologize all over myself if the bikes make it through more than a few weeks without being stolen. After all, they swiped this poor pizza guy's bike, and it stuck out like a sore thumb made of rainbow pizza dough, so you couldn't really ride it around. What are they going to do with real class machines. Time will tell, but until such time has told, the bike racks are being set up at nine points: Castel dell'Ovo (the Egg Castle), Maschio Angioino (the fortress at the port), via Toledo, piazza Bovio, piazzetta Nilo, piazza Dante, via Duomo, piazza Garibaldi and Brin (the bus company) garage. Plans call for 100 bikes. It seems to be set up rationally; that is, log-on, credit card, DNA sample, frontal lobe chip implant, the city holds your family hostage—the usual stuff. It's fool-proof. Big fault—you can only rent the bike for 30 minutes, presumably just enough time to get to the next bike station and ransom your children back. Did I say it was fool-proof? (Sept 6) There is some consternation in the press about what some view as a land grab by the Ravello Foundation. The annual Ravello Festival (see here and here) is what draws most foreigners to this jewel above the Amalfi coast, BUT there is still a town of Ravello full of real people who live and work there. The town council is quite separate from the Ravello Foundation; the latter owns and operates, for example, the premises of the Villa Rufolo, the centerpiece of the annual arts festival. That foundation does not, however, own and operate a number of other significant structures in and around Ravello. The new Oscar Niemeyer auditorium, for example, is the property of the town of Ravello and not of the Ravello Foundation. It's an important difference, since now another "jewel of the Amalfi coast" the Villa (or Palazzo) Episcopio (image, right) has been put in the hands of the Ravello Foundation, which will restore the building and premises at a cost of three million euros. That particular building is of a certain historical interest. It was the Ravello Episcopal (that is,of the bishop) Residence from 1086 until 1818. It was restored by Richard Wagner in 1880 and has hosted royalty and celebrities. It was the summer residence of the house of Savoy, the Italian ruling dynasty (until the declaration of the republic in 1946) and the seat of the first post-Fascist government of liberated Italy under marshal Badoglio. It is where wartime king Victor Emanuele III abdicated in favor of his son, Umberto, in 1944. The building, itself, has had a number of recent restoration projects paid for by the taxpayers. The original idea was that the Villa Episcopio would serve to promote the general culture of Ravello and the Campania region, and not be simply another piece of the Ravello Foundation. (Sept 7) The Samurai Academy has opened in Naples in a basement gymnasium on the premises of the San Paolo stadium in Fuorigrotta. It bills itself as the only such academy in Italy. It is the brainchild of a father and son Neapolitan team, enthusiasts of the tradition of the Samurai, the warrior class of early and medieval/modern Japan, which mixes the physical practice of Kendo, Kenjutsu and Ninjutsu with the transmission of the spiritual values of honor and strength of character. Kendo means "Way of the Sword" and is the modern Japanese sport/martial art practiced with bamboo swords and protective armor. As a sport it is widely practiced in many places in the world. Kendo descends from Kenjutsu, the umbrella term for all schools of Japanese swordsmanship originating with the Samurai. Ninjutsu is the martial art, strategy, and tactics of unconventional warfare and guerrilla warfare as well as the art of espionage purportedly practiced by the shinobi (commonly known outside of Japan as ninja). Ninjutsu was more of an art of stratagems and deception rather than a strict martial art but often incorporated forms of battlefield grappling and hand-to-hand combat. (Sept 7) "In the name of the Father, the S... gooooooooooaaaall!" I heard some time ago that the new Partenope university had acquired classroom space in the very historic church of San Giorgio dei Genovesi on via Medina between the City Hall and the main police station. (The original church was from 1620 and the work of Bartolomeo Picchiati, the architect who supervised the construction of the Royal Palace.) I also recall seeing a university plaque at the entrance. That seems to have changed. The city now announces that by Christmas, the church will be converted to... drum-roll--or at least some really loud catcalls, boos and raspberries... a football museum! That's right. Instead of locating it, oh, let's see, somewhere on the premises of the San Paolo stadium, they're putting it here--"it" being a gallimaufry of soccer balls, photos, uniforms, posters, plaques, T-shirts, trophies and other memorabilia (spray cans, brass-knuckles, stink-bombs, and forbidden firecrackers, one hopes). Various spokespersons are even proud of the idea. Just think, they say, this will be the only museum of its kind NOT located on the premises of a sports arena! First, that cannot possibly be true. Second, golly-gee. (Sept 14) The papers are absolutely ecstatic about it. It's some sort of a record! Imagine: 15,000 tourists will be led like lambs to s... uh, disembark from three gigantic cruise ships on the same day, the day after tomorrow, at about the same time in the port of Naples. 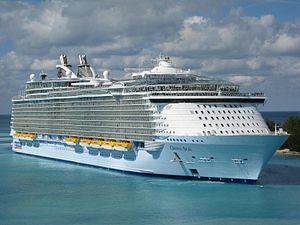 Among the three will be the Oasis of the Seas (photo, right), billed as the largest ship in the world, the first of the new Oasis-class cruise ships, owned and operated by Royal Caribbean International, and normally cruising the Caribbean out of Port Everglades in Fort Lauderdale, Florida, in the United States. She is 361 meters long, has 16 passenger decks, and carries 6,000 passengers and 2,000 (!) crew. Port of registry: Nassau, Bahamas. Built by STX Europe, Turku, Finland. Maiden voyage, December 2009. The plan is to have 150 busses, 100 rental cars, 70 legal taxis, an unknown number of gypsy cabs with drivers who have hand-lettered "t-a-k-s-i" on their t-shirts and some of those red double-decker open-air See the City busses. Lots of cops, too. I have been on a giant cruise ship for a voyage from Naples around the Med and back, and Naples was the most chaotic and worst run port of anywhere we docked. (Barcelona was the best.) When we disembarked back in Naples, there were no cabs unless you walked a gauntlet of seedy types all wanting to sell you something or take something from you. Oh, you can't turn left out of the port, but you can turn right and turn around somewhere south of Salerno, I think. Yes, but this time will be different.